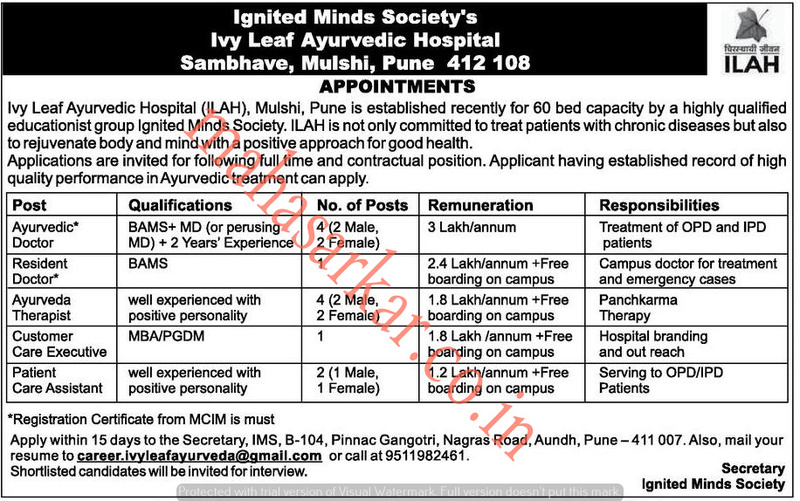 ILAH Mulshi (Lvy Leaf Ayurvedic Hospital),Mulshi Published Job Notification for 17 Doctors -Patient Care Assistant & More Posts. Candidates who wish to apply must look at ILAH Mulshi Doctors -Patient Care Assistant & More Recruitment 2018. Eligible candidates can apply Offline before 27-03-2018. Education Qualification: BAMS/MD/MBA/PGDM and More. For Post wise Education Details follow the detailed advertisement. Interested & Eligible candidates can send their application along with all the necessary documents and testimonials to Secretary, IMS, B-104, Pinnac Gangotri, Nagras Road, Aundh, Pune- 411007. Also mail resume to career.ivyleafayurveda@gmail.com. Starting Date, Last Date to Apply Offline at Lvy Leaf Ayurvedic Hospital which candidates should be remembers as follows. Start Date to Apply Offline: 13-03-2018.